I´m not really a Black Metal fan, and all those 1-man-projects are somewhat suspicious. But this here is indeed something that makes me almost wet my pants with excitement. If the rest of this 17 h oevre sounds like this 25 min clip, I can only recommend "02002" to everybody, really EVERYBODY. Radical, without compromise in every aspect. The music can be discribed as extreme Old School, a sound so rough, distorted and washed-out you can hardly identify any instruments (the band info gives no clue either), and those "vocals" sound not-human.... although sometimes the accent makes clear that his is no native Finn here. This music will definitely make you feel desperation, primal fear and total horror. 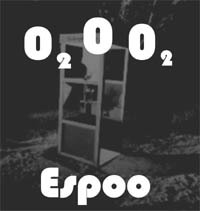 Especially if you know the tragic background of this "Espoo" project: The solo artist 02002 from New Zealand got lost during a winterly-night-out near Finnish Lake Bodom and was found half-frozen half-dead next morning in a telephone booth. Only reading Espoo´s phone directory had kept him awake and alive, and such this project was born - a 17 hour-20 CD musical version of Espoo´s telephone book. Radical. Ingenious. Buy it.